GitHub - scikit-hep/vegascope: View Vega/Vega-Lite plots in your web browser from local or remote Python processes. View Vega/Vega-Lite plots in your web browser from local or remote Python processes. Want to be notified of new releases in scikit-hep/vegascope? VegaScope is a minimal viewer of Vega and Vega-Lite graphics from Python. The Python process generating the graphics does not need to be on the same machine as the web browser viewing them. VegaScope has zero dependencies and can be installed as a single file. It can be used as a Python library or as a shell command, watching a file or stdin. (with --user if not superuser) or copy the single vegascope.py file to the desired location. This stocks.vgplot.line().spec is a JSON object representing a timeseries of stock prices. It is too complicated to read manually. Import vegascope and create a LocalCanvas. It opens a tab in your web browser (hint: look for it on other desktops or create a browser window in the current desktop first!) for drawing Vega graphics. Every time the canvas is called as a function on a Vega graphic, the web page will be updated with the latest plot. There is no need to refresh your browser. Or a JSON object as nested Python dicts. It supports the Vega 3 and Vega-Lite 2 specifications. Save as PNG: create a PNG image in your downloads folder (file name is the current title + .png). Save as SVG: create a SVG image in your downloads folder (ending in .svg). SVG files can be edited as vector graphics (you can move the data points around, add annotations) and converted losslessly to sharp PDFs. My favorite tool for editing SVG and converting to PDF is Inkscape. Zoom buttons/box: scale the graphic on the web page. Does not affect saved file size. View source: to see the raw JSON. View in editor: to edit and view the graphic in the official Vega editor. This editor gives you a lot of insight into how Vega declarations translate into graphics, but it's not optimal for rapid-fire plotting. However, your web browser will probably interpret this as a pop-up. You usually don't want web servers to remotely write files to your disk! In most web browsers, an indicator appears in the location bar the first time you try to write a file programmatically; select it and allow pop-ups for this server. All of the examples above used vegascope.LocalCanvas. 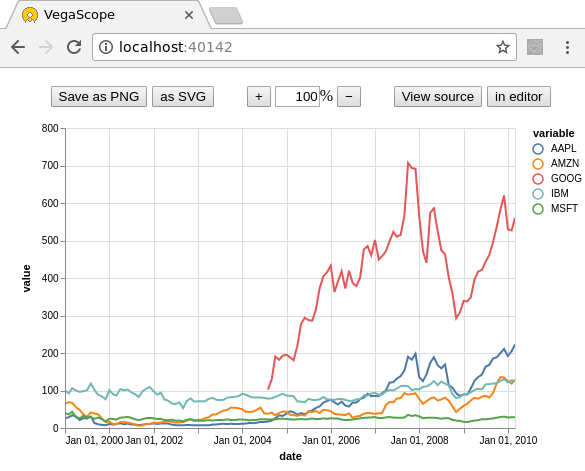 To make the web server visible to the world, create a vegascope.Canvas. where 8.8.8.8 is the real IP address of the machine running VegaScope. Everything proceeds as before except that the web browser is no longer restricted to the same machine as the server. However, the connection may be blocked at any step between the server and the client. Most system administrators block all ports except a list of justified exceptions; you may need to ask for a port to be opened and explicitly pass that port. Even beyond port blocking, some administrators may block the HTTP protocol, since web servers can be used for less benign activities than plotting. They may cite a security risk in projecting your data to anyone with the address (though you can monitor who's watching with canvas.connections). It depends on the sensitivity of your data. If an unrestricted web server is not an option for you, but ssh is (after all, how are you connecting to the machine's terminal? ), consider vegascope.TunnelCanvas. The TunnelCanvas is only available locally, but you can extend the meaning of "local" through an ssh tunnel. Assuming that you're already connected to the remote machine through one ssh terminal, open another terminal and paste the new ssh command into it. As long as that second terminal is open, your local web browser will see http://localhost:43213 as the remote one. Whereas vegascope.Canvas is world-readable, vegascope.TunnelCanvas is as safe as ssh. Choose the option that best fits your security constraints. VegaScope instructs your web browser to use a recent Vega, Vega-Lite, and Vega-Embed version from cdn.jsdelivr.net. If you'd like a different version, you can specify vega="3.3.1", vegalite="2.5.2", vegaembed="3.15.0" in any Canvas constructor. Passing None or an empty string uses a standalone version embedded within the vegascope.py file. This is useful if your computer (specifically, the one your web browser is running on) is disconnected from the internet. VegaScope can be used within Python (import vegascope) or a shell command.
"" to use an standalone copy. In file-watching mode, the canvas will update when the file is overwritten. In stdin-watching mode, the canvas will update when a one-line JSON document is passed to stdin.